If you love healthy Mexican food as much as I do, you are going to love these Sheet Pan Chicken Fajitas! 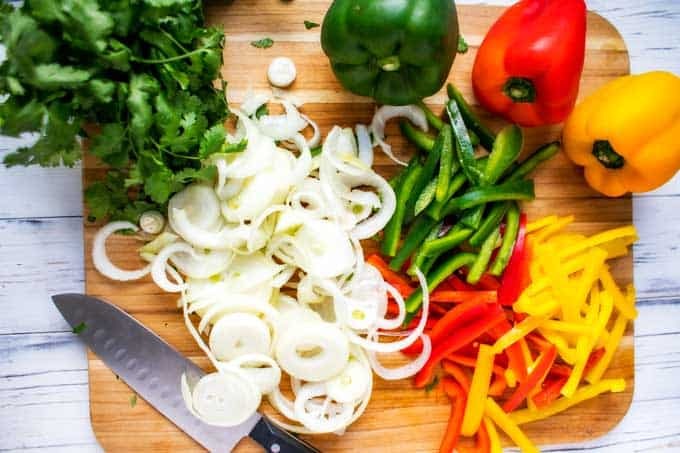 With tender chicken marinated in a garlic lime marinade, bell peppers, onions, and tortillas, this recipe is a satisfying meal that is perfect for a clean eating diet. One area that I have struggled with through the years is healthy dinners. Historically, I do great with meals for the whole family at breakfast and lunch. By dinner time, everything falls apart. I get up so early (3:30 am) that by 6 pm I rarely feel motivated to cook a full meal. 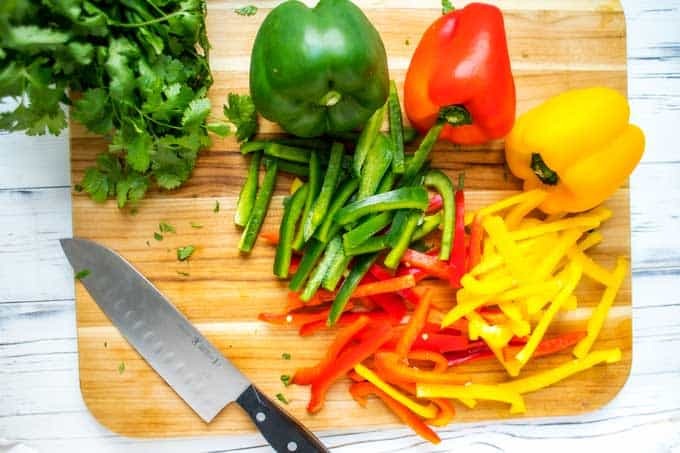 Because of this, I have a strong preference for meals that can be prepped early in the day (or even on the weekend) and pulled out at dinner time. This has become more important than ever now that I am feeding two teenage boys. 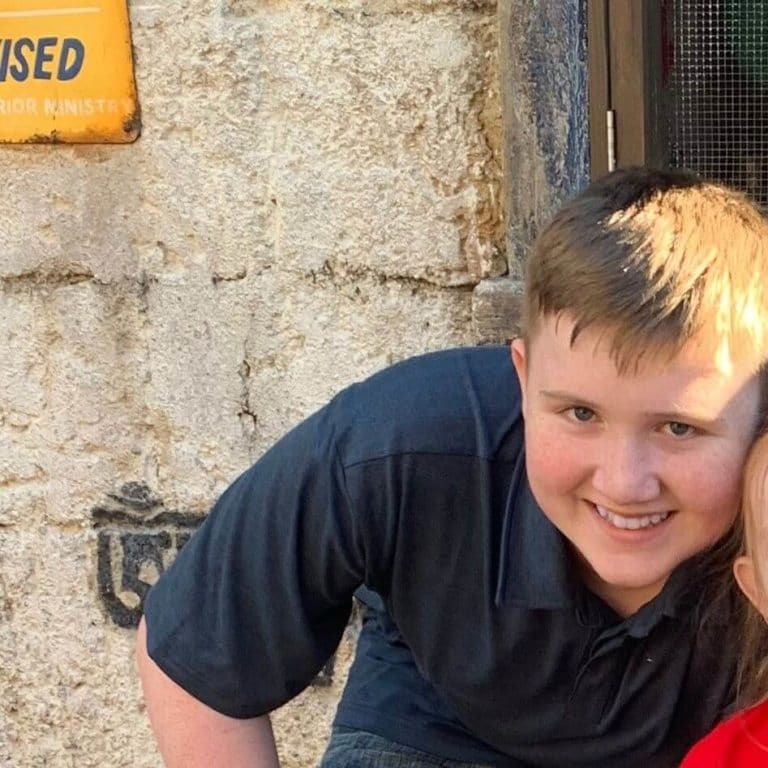 This kid just turned 13, and he’s already 6 feet tall. You can imagine what my grocery bill is starting to look like. It is so easy to have a casserole in the fridge and pull it out! For years an easy night for me usually meant a super-cheesy pasta dish. 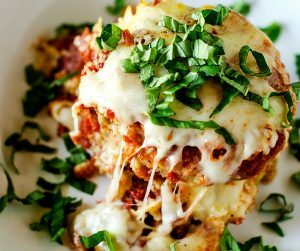 I love casseroles, and will never give up my cheesy pasta, but I’ve been working on easy dishes that are a little bit lighter. One way that I’ve found that works for our family is sheet pan dinners. Sometimes the easiest way to do something is also the best. Sheet pan dinners have become one of my favorite ways to cook on busy weeknights. To me, it is a more hands-off approach to one pot cooking. It is the perfect way to make sure a family dinner happens when I’m short on energy. I love that all the ingredients can be prepped in advance, leaving me free to enjoy extra quality time with the family. 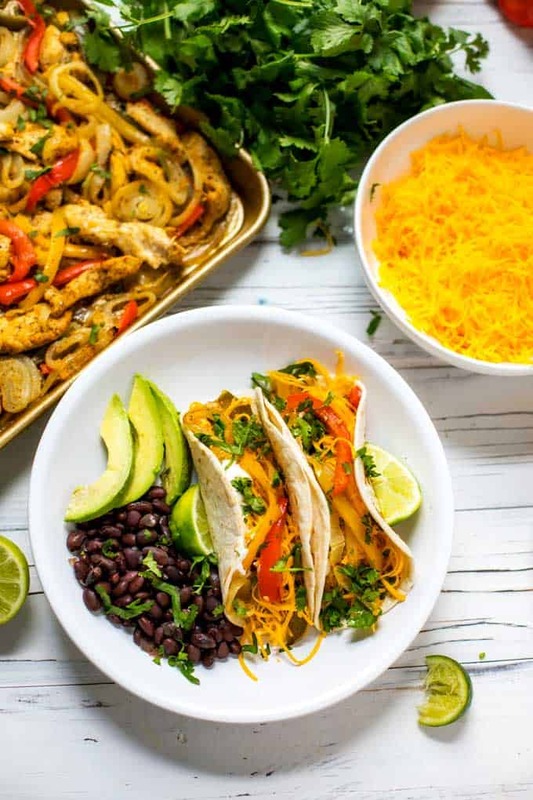 Next time you know you need a quick and easy meal that the whole family will approve of, give these Sheet Pan Chicken Fajitas a try! 1.1 What Goes in Chicken Fajitas? 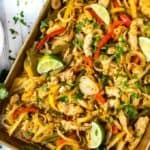 1.2 How Do I Season Chicken for Fajitas? What Goes in Chicken Fajitas? There are several ways that you can choose to season chicken for fajitas. 1. I’ve used a homemade marinade that uses a Southwestern seasoning blend. This gives you all the benefits of the taste of a homemade marinade without having to mix up a custom spice blend. 2. You can purchase a packet of Fajita seasoning. 3. You can make a marinade with a custom fajita seasoning blend. Here is a good example. Fajitas can undoubtedly be a part of a healthy diet, provided the portion size is sensible. If you are watching calories, you want to pay close attention to the amount of cheese and sour cream you use. Go heavy on the veggies, and keep the chicken to a 4-ounce serving or less. Another option is to skip the tortilla and serve over a bed of greens. If you make this recipe and like it, don’t forget to leave a five star rating! 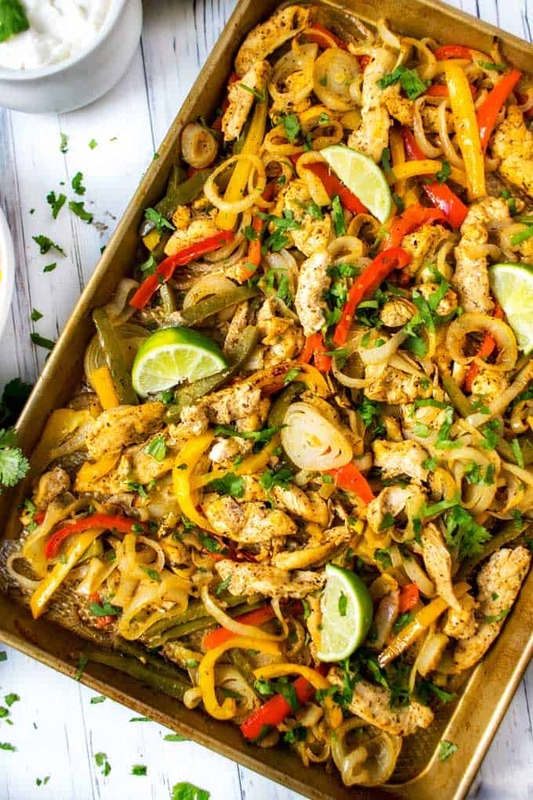 If you love healthy Mexican food as much as I do, you are going to love these Sheet Pan Chicken Fajitas! You will love how easy these Sheet Pan Fajitas are to make. They have become a regular family meal at our house, and they just may become one at your house too! 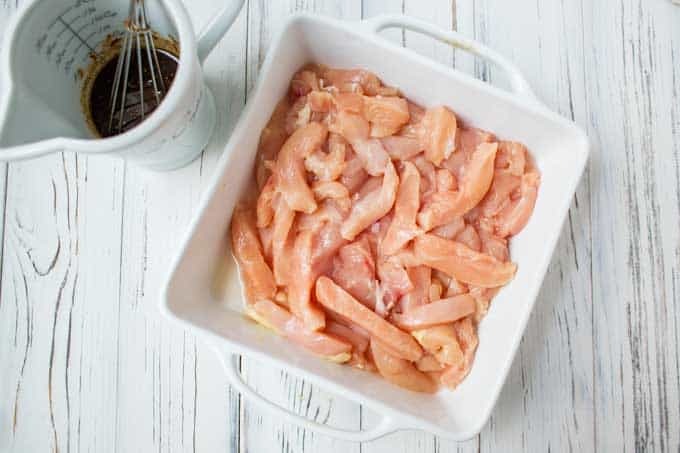 Place chicken strips in a shallow dish. In a small bowl whisk together lime juice, avocado oil, garlic, and Southwestern seasoning. Reserve 3 tablespoons of the marinade. 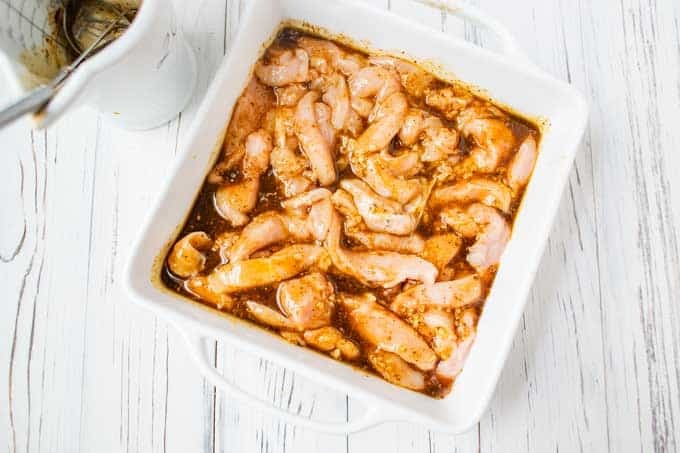 Pour remaining marinade over chicken and marinate 30 minutes to up to 2 hours. Place a sheet pan in the oven and preheat to 400 degrees. Carefully remove sheet pan and arrange chicken, onions and peppers, on the sheet pan. Bake 25 - 30 minutes, brushing halfway through with reserved marinade. If You don’t have Southwestern Seasoning, use 1 teaspoon chili powder, 1/2 teaspoon each cumin, garlic powder, salt, and paprika. Fajita season or taco seasoning also work. I use organic flour tortillas for the family, and gluten free organic corn tortillas for myself. Cut a zucchini and yellow squash into matchsticks and toss with a tablespoon of olive oil. Sprinkle with salt. Add to the Sheet Pan Chicken Fajitas in the last five minutes of cooking. For a little more heat, add in 1/2 teaspoon crushed red pepper to the marinade. Serve with Avocado Cream or Bacon Guacamole. Never made chicken fajitas before and this looks really delicious. I need to add this to my menu. This is one of my favorite ways to make chicken fajitas or steak. They are simple and clean up is a breeze! These look absolutely amazing! I want to run to the store right now and try them for dinner tonight! I love sheet pan recipes. I did pin this for future references cant wait to make this! I haven’t made fajitas in awhile. What a good idea for a weekend dinner (this weekend, lol!). I could get behind this recipe. Fajitas are so much fun, but quite a bit of work to perfect. Love your pics of your food. Definitely this is a a very popular plate . I love fajitas, I mean who doesn’t , I will try your receipt for sure. I love chicken fajitas. This recipe looks and sounds so delicious. Thanks for sharing. Now you’re just making me hungry for fajitas! Everything looks so colorful and the marinade sounds AMAZING! Oh my goodness I love that this could feed my whole family and all our odd needs. I am keto and this would totally work with that too! Fajitas are a go to meal around here. I’ve never tried them using a sheet pan! I love making sheet-pan fajitas! It’s a family favorite. Thank you for sharing your delicious recipe! I need to make this. I am in a dinner rut and this looks delicious. We are fans of Mexican food and chicken fajitas is one of our favorites. Your recipe looks so good and easy to prepare too. Hi Wendy! I never would have thought to make chicken fajitas in the oven! 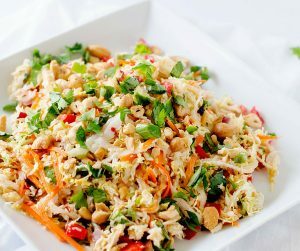 It looks delicious and easy! I have to get my hands on the seasoning. I can think of a few dishes where I can use it. The recipe looks so delicious! I love Mexican food. 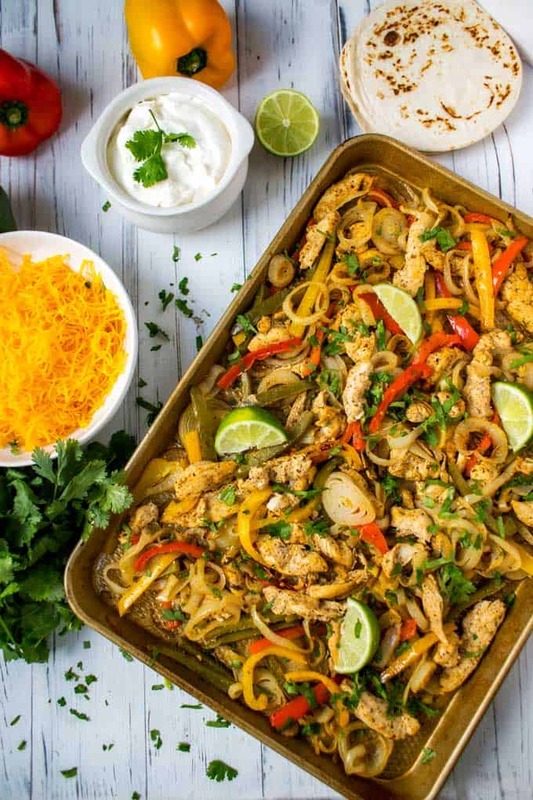 This chicken fajitas recipe would be perfect for the weekend! There are so many variations with this delicious recipe. I don’t think I could do without the tortilla though. We recently started eating fajitas a lot. They take so long in the frying pan. I love this sheet pan recipe.